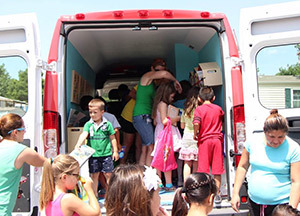 Summer winds down for a Union school’s bookmobile. It’s been over a year since Ellen DeGeneres surprised McAuliffe Elementary with a brand new bookmobile. Now, as the new vehicle ends its second summer in operation, the school’s summer book program is firing on all cylinders. Back in 2014, Kirby Mackenzie, the Union school’s library media specialist, contacted the “Ellen” TV show about the school’s program to brings books to students in their neighborhoods. The talk show host unveiled a state-of-the-art van, complete with interior seating, iPad stations and, most important, plenty of space for books. Moreover, the national publicity helped the kids buy into the program, when flyers, phone calls and refrigerator magnets weren’t making the impact teachers had been hoping to see in Broken Arrow. This year, the wheels have been turning in the minds of Mackenzie and other teachers at the school, trying to develop ways to take the program — now in its fourth year — to a new level. Students receive postcards with each book they check out from the van and are encouraged to write or draw a response to the book. These postcards can be deposited at special mailboxes throughout the neighborhoods. 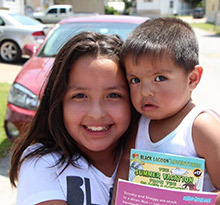 When the van returns each Tuesday, children who returned postcards qualify for prizes, and volunteers continue the dialogue that the child began with the postcard. “Multiple kids have said, ‘Look what I wrote!’ telling me about the responses they’ve written,” Mackenzie said. Just during the first week of the summer, teachers received 80 postcards. Long said reading is particularly important during the summer to prevent the so-called “summer slide.” The term refers to the general learning loss that tends to occur when children are not in school. This setback can be devastating to the gains made by children during the regular school year. “There’s a separation between students who read and don’t read during the summer. We don’t want that summer reading loss,” Long said. In 2014, 76 percent of students who visited the Mobile Media Van at least twice during the break did not experience a summer slide. With the improvements made to the program this year, Long said she is excited to examine the growth/loss rate of reading skills when children return to school. 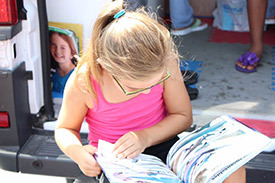 To inform parents about the summer reading program, the school hosted a Summer Slam outreach, in which parents were invited to the school to learn about the program. After signing a reading contract, families could pick up 10 free books, and a free dinner was served. More than 90 percent of families responded. Long said it takes time to develop a successful bookmobile program, and the school uses the van year-round. In the winter, the bookmobile builds community bonds by serving hot chocolate when it makes stops in the neighborhoods. The summer reading program is run entirely by volunteers including Mackenzie, who remains “Ellen’s” biggest fan.